The music on this recording, written towards the end of Couperin’s long and prosperous service to Louis XIV, belongs to a tradition of private and intimate, even therapeutic, chamber music. It also mark the end of the greatest period of French viol music. The more extrovert violin had already begun its triumphal progress which continues even today. Many connoisseurs of the viol considered their favourite instrument far superior to the upstart violin. Hubert le Blanc argued that the special bowing technique of the viol made it possible to convey emotions in a particularly nuanced and subtle way while Jean-Jacques Rousseau admired the tendresse of the viol’s sound. Listening to the Couperin works for viol it is easy to share the view of these enthusiasts. 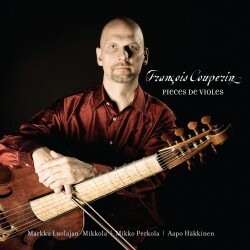 The highly refined style, the composer’s absolute technical mastery of his craft and the freedom and elegance of Couperin’s musical imagination highlight the viol’s timbre to great effect.